The Archdiocese of Sydney has showcased Australia’s very first Catholic video game, with two of its bishops facing off in a down-to-the-wire battle royale. The Adventures of Saint John Paul the Great will get its official launch at the Australian Catholic Youth Festival next month, but was last week previewed for youth leaders and media. The game was created by Xt3.com intern Regine Caramancion, 21, and will give gamers the chance to play as Karol Wojtyla, collecting saints’ medals, bibles, cakes and rosaries, while evading the dangers of falling boulders, bullets and Nazis. 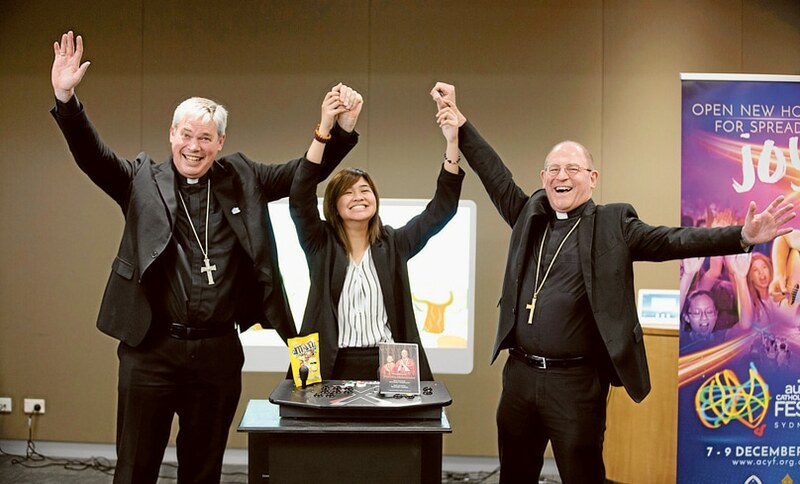 ACYF youth ambassadors, NET Team members and staff from Sydney Catholic Youth were on their feet as Bishop Richard Umbers came tantalising close to besting the time of his brother bishop, Bishop Anthony Randazzo. The game ended – somewhat miraculously – with both men achieving the same time and the same number of points. Bishop Randazzo joked that the dead heat must have been “divinely inspired” and pointed out that both he and Bishop Umbers had – after all – been ordained to the episcopate on the same day, side by side. Sydney Archdiocese Digital Media Manager Laura Bradley said the game was a fun and novel way of teaching young people about the life of one of the greatest saints of the 20th century. “We know gaming culture is very popular with youth and young adults,” Laura said. Regine said it was exciting to think that thousands of young people would be playing the game – her first – in a little under a month’s time. “It’s such a big opportunity,” Regine, who is a member of the youth movement, Youth for Christ, said. “It’s helped me recognise what I want to do – to keep making games about the bible and based on saints.